Can small children go rafting with Vivere L’Aniene? Yes, starting from the age of 2 years old. Is it necessary to be able to swim to go Rafting with Vivere l’Aniene? No, as far as standard rafting is concerned, yes for power rafting. Are there any weight limits to go Rafting with Vivere l’Aniene? Yes, the maximum weight limit is 130 kg. Would my dog be allowed to go Rafting with Vivere l’Aniene? Can I use my credit card or bancomat to pay? Yes, we have a POS for credit card/bancomat payments. How about my outfit to go Rafting with Vivere l'Aniene? Where can I leave my backpack and my valuable items while Rafting with Vivere l’Aniene? How do we get back to Vivere l’Aniene Rafting Centre when the activity is over? We have a shuttle bus driving you back to the Rafting Centre. Are there any bars, restaurants, picnic areas close to the Vivere l’Aniene Rafting Centre? food, fresh water and a big dose of cuddles! Are children allowed to participate to Vivere l’Aniene Hiking activities? Children are welcome when easy/medium excursions are involved. However our guides, helped by parents, will examine every single situation. For infants we recommend the special infant backpack (supplied on request). If the weather deteriorates, will the Vivere l’Aniene Hiking activities take place? It is up to our guides to judge the weather conditions where the excursion will take place. In any case we shall get in touch with you one day in advance for details and confirmation. Are dogs allowed to Hiking activities with Vivere l’Aniene? Yes as a rule. Yet dogs are not allowed in some Protected Areas. The owners will be informed beforehand. Our guides often organize some dog trekking under the guidance of dog instructors during which our four legged friends will improve the relationship with their owners. Are beginners accepted to Vivere l’Aniene Hiking activities? Yes indeed! Our excursions vary according to their difficulty and are generally suitable for all. The level of difficulty is mentioned in every excursion on the reference scale. Which are the grades of difficulty? EE= finalized to experts: suitable for trained walkers, accustomed to ups and downs and long distance walking. Of course the kind of path you are walking on may be hard, for instance with exposed zones, hand-foot passages and so on. Where is the meeting point for the Vivere l’Aniene Hiking activities? Generally speaking the meeting point is by the River Sport Centre in Largo Martiri di Cicchetti, 1. If referring to excursions in Monte Livata the meeting point will be in the Visitors Centre in the Simbruini Mountains Park. Excursions far from Subiaco will be given the intermediate dates at the beginning of the path. In any case, each excursion is described with technical specifications. How long do the Vivere l’Aniene Hiking activities last? 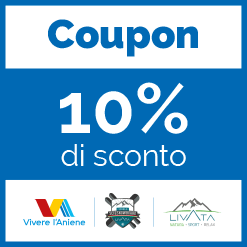 How much does a Vivere l’Aniene Hiking activity cost? The fees are variable. Contact us in advance to learn those regarding the chosen excursion. How about booking a Vivere l’Aniene Hiking Activity? Contact us after having chosen from the calendar. Please write down your name and surname, mobile phone number and number of participants. Who can take part to the Vivere l’Aniene Orienteering? Everybody! Different routes for different ages, from little ones with simplified maps and game routes to adults, according to their personal training and technical capabilities. There are routes for all characteristics. The Trail-Orienteering discipline is also possible for tourists in need of particular necessities. We recommend you specify your age and requests when booking in order to assemble same age groups. How long does a Vivere l’Aniene Orienteering outing last? From 2 to 4 hours according to the route which will be maximum 6 km long. Where does Vivere l’Aniene Orienteering take place? Our routes take place either in Subiaco historic centre, or in Cervara di Roma, or in Jenne, or else in the splendid beech forest in Livata Mountain. You will not get lost! Is Vivere l’Aniene Orienteering an individual or a group activity? The more the merrier! Born as an individual sport, it is useful to enjoy it with friends, with a team building group or as an open air lesson for school groups. Members of groups will experiment on how to share choices and how to grow confidence with team companions. If performed individually, one is bound to acquire self confidence in his/her capabilities. How high is the risk of getting lost when Orienteering with Vivere l’Aniene? No risk whatsoever. The activity is performed step by step so that different techniques and strategies are learnt gradually in order to move in total safety. In the final phase consisting of searching for hidden objects in the wood we often propose a “star” route which means going back to the starting point. Do I need to take any specific equipment with me when Orienteering with Vivere l’Aniene?